In a lengthy opening statement to the committee, Donal Conway acknowledges the FAI breached Sport Ireland rules by not informing the body about former chief executive John Delaney's €100,000 'bridging loan' to the association in 2017. "I refer to Clause 4.3 of the 'Further Reporting' section of our annual terms and conditions. It requires the Association to notify Sport Ireland in writing in the event of any material deterioration in its financial position," Mr Conway states. "We acknowledge that certain circumstances arose in April 2017 which were not reported to Sport Ireland. We will work with Sport Ireland in order to establish a process to ensure the FAI are, in future, fully compliant with clause 4.3." "I apologise and accept more information would have assisted Sport Ireland and the committee," he says. Mr Conway also confirms the FAI will use an outside independent body to find a new chief executive. RTÉ has also obtained the review by sports industry consultant Jonathan Hall into governance at the FAI, which precipitated Mr Delaney's move from Chief Executive to Executive Vice President within the FAI. Mr Hall states the review's scope was specifically to "review the current role and responsibilities of the FAI Chief Executive". The review totals 18 pages, with Mr Hall saying it was to be completed so as to ensure it could be considered at the FAI's board meeting on 22 March. The main body of work of the review consists of confidential interviews with senior FAI figures to ascertain their views on the current role and responsibilities of the Chief Executive. "It is important not to jeopardise the current Chief Executive's position as a member of the UEFA Executive Committee given the importance of it to the FAI. "There was widespread recognition that the current Chief Executive worked incredibly hard over very long hours." "If the FAI decide to go ahead with two roles of Chief Executive and Executive Vice President rather than one then this should be explained to the current Chief Executive and ideally done in a consensual way." Mr Hall makes ten recommendations including the creation of a new role of Executive Vice President. However, Mr Hall does not reveal when he started his review, or how many hours he put into its completion. Speaking on RTÉ's Drivetime programme, the Chair of the Oireachtas Sports Committee Fergus O'Dowd welcomed confirmation John Delaney will appear at the committee tomorrow. He also revealed the Chairperson of the Corporate Governance Association of Ireland James Kavanagh will advise the committee tomorrow ahead of the hearing. Meanwhile, Fine Gael TD for Dublin North West Noel Rock has said it is quite clear there is a "bit of a crisis of corporate governance in the FAI." Mr Rock said it would seem the organisation has been "privately,behind closed doors" lurching from one financial crisis to another. 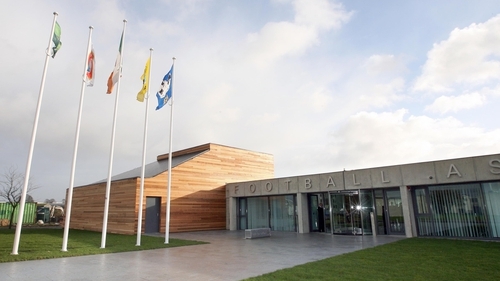 Senior members of the FAI will appear before the Oireachtas Sports Committee tomorrow. Mr Rock, who is a member of the Oireachtas Sports Committee, said there is an increasing growing list of questions that the FAI must answer about the loan given to it by Mr Delaney. He told RTÉ's Today with Sean O'Rourke that the FAI's opening statement contradicts one made on 18 March when it said its board had been kept appraised of all details of the loan. Mr Rock said he wants to know when the board found out about the loan, what the terms of the loan were and whether these terms were agreed by the board. He added that he would also like to know why the loan was necessary and why the FAI did not have an overdraft facility it could use. In addition, he said, the FAI should explain why it requested advance draw down of funding from Sports Ireland for five years in a row, which would point to cash flow problems. At the heart of the matter, he said, was a most unusual arrangement between the board and Mr Delaney and it would appear the board was more accountable to the CEO than the CEO was to the board. Mr Rock said he believed that Sport Ireland should have been more robust in its dealing with the FAI and that Sport Ireland should also reserve the function of withholding taxpayer funding, in the event the Committee does not get an adequate explanations as to the ongoing "apparent cash flow difficulties within the FAI." He said he did not believe he had jumped the gun by calling for Mr Delaney to step aside and that he still believed that Mr Delaney should leave the FAI.